You can always tell when a mountain biker has their seat high because you don’t see it very often which makes them stand out. This got me wondering. Why do mountain bikers have their seats so high? Mountain bikers seats are high so they can increase their pedal power and efficiency. It allows the rider to almost fully extend their legs while pedaling, this helps to avoid damaging your knees. It elevates the center of gravity which improves your bike handling. There are many benefits to having your seat higher and at the correct seat height in relation to your body. This will improve your mountain biking performance. 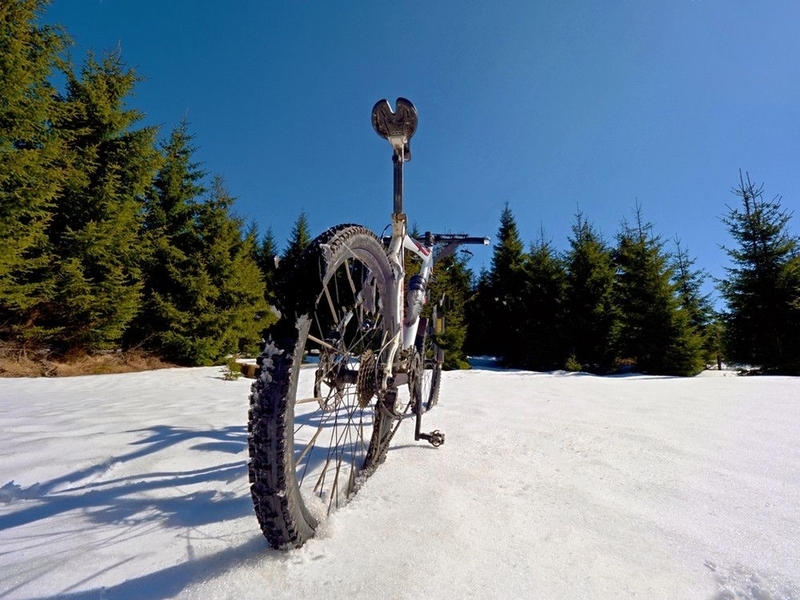 Mountain biking requires that you ride on many different types of terrain. In order to do this you need to have a smooth powerful pedal stroke. If you don’t then you will get tired more quickly. Especially your legs, they will get tired and pedal in an awkward fashion. When you have a higher seat on your bike you will increase the cadence of your pedaling. This is the number of revolutions of your pedal per minute. If your seat is low, then your knees will be bent more. This will cause your leg muscles to work harder at pedaling and you will tire faster. Having a higher seat enables you to extend your legs fully on every downward pedal stroke. Each downward pedal stroke takes less effort and puts less pressure on your knees. Using a low seat will cause you to muscle the pedal stroke downward more and place more pressure on your knees. Raising your saddle post puts your knees in a better position. Your knees will be in a better alignment with your pedal spindle during the downward pedal stroke. There is more risk of injuring your knees when they are more forward in relation to the pedal spindle. When you are riding on technical trails and you are not going too fast a higher seat can help improve your bike handling capability. You can put your weight on the saddle which then transfers through to the back wheel. This gives your rear tire more traction on the trail. Riding on a high saddle raises your center of gravity. You can control the bike better from this position by putting weight on the saddle and using your body weight to direct the mountain bike. You can lean left or right steering the entire bike instead of only using the handlebars. If you are sitting on a low seated bike then you body weight is like dead weight. Its like you are sitting on a sofa, you can’t move around very easily. Its more difficult to shift your weight left or right when seated so low. Plus your back will be rounded which further reduces your movement. A higher seat and the correct seat height in relation to your body will ensure you are in the best position to handle the trails. Have someone hold your bike while you are sitting on the saddle or place your bike in a bike training stand so that it remains upright when you are sitting on it. Pedal forward with the right or left leg so that it extends to the bottom of the pedal stroke. Make sure that the crankarm is inline with the seat tube. As the leg is extended in this pedal position the ball of the heel should be able to just touch the pedal. The knee should also be locked out. If the knee is not locked out, but bent, then you need to raise the seat a bit and try again. If the knee is locked out but you can’t touch the pedal then the seat is too high and should be lowered. Just keep going back and forth until you find the right height. There are a few situations on the trail where you can take advantage of riding with a high seat. First before you get out on to the trail you can lower your seat by half an inch to an inch from where you originally set your seat height. This will give you some extra clearance between your backside and your saddle. This is helpful when you want to raise yourself above the seat and shift your weight to the rear wheel when you are going downhill. Even though you have lowered your seat, there is no need to worry. Because you have lowered the seat so little your pedaling performance will be the same when climbing and on flat trails. You will find that it is a good idea to have a high saddle when you are cornering. You’ll be able to sit into the bike more and transfer your body weight more easily. Your body weight will transfer through the seat post, down to your pedals, and on to your rear wheel. This will enable you to have more grip using your back wheel. Continue pushing through the back wheel as you come out of the corner. This process will help you to enter the corner fast without needing to slow down, and you maintain control going through the corner until you exit. When you come upon a flat turn some mountain bikers will lean forward putting more weight on the handlebars. They will try and muscle through the turn by pulling on the handlebars in order to pedal faster. There is a much easier way. Instead of doing that. Riding with your high saddle, sit down into your high seat and do a slight pelvic thrust. This will help you to send more traction down to your feet and pedals. Sit back into the seat and extend your inner leg out. If you are turning left extend your left leg out straight. This will help to send your body weight down through the seat and down to the back wheel. You will have more of a gliding feeling through the turn, as if you are on a rail. When you are riding downhill you are riding faster, which means everything comes out you faster. Some turns may surprise you, so you are going to need to shift you weight to the left or right quickly. This is best done when your seat is lower, so you can maneuver your body faster by getting up out of the saddle. When you encounter a drop off or a jump you are going to need to get up out of your seat. Then you need to shift your weight back out over your rear wheel. If your seat is high you may not be able to do this quickly or you may get stuck on your saddle. Once you do shift your weight back you may have trouble get back on your seat from that position because the seat is high. If you are riding over rough terrain like rocks and roots your legs need to act as shock absorbers. If your seat is high you will not be able to stand up on your pedals and let your legs handle the impact. Plus as you go over rough terrain the saddle will keep bumping into your buttocks and you may damage your crotch area. If you need to dismount your bike in this situation it will be more difficult to do with a high seat. If you like to do wheelies or manuals or any other type of bike tricks a high saddle is not a good idea. You need to be able to shift your weight easily and quickly in order to do these tricks. A higher seat keeps your weight too far back. My suggestion is to use a dropper seat post so you can adjust the height of your seat according to where and how you are going to ride.